My husband eats: Meat (including: steak, pot roast, chicken anyway but baked, bacon, and pepperoni), bell peppers, potatoes, bread. Maybe some lettuce. Maybe a few carrots. I eat: Mostly plant based, but sometimes incorporate eggs–especially since after Easton, I initially thought soy was upsetting his stomach (after accidentally eating it & discovering he had no issues, I chalked it up to a young stomach and over-active letdown). Things we have in common: bell peppers, carrots, potatoes, lettuce. I used to just cook two meals. One for me and one for him. We’d eat the same side salad, I’d cook something for myself while meat was marinating and grilling. But, y’all. Ain’t no moms got time for that! For real. So I’ve been practicing my crockpot creativity, chatting up my grandmas, and hunting down slowcooker recipes. Also, I’ve been making huge beans and grain salads 1-2 days a week which I spoon over greens for me. This way there is always a quick and easy back up plan–for the days I can’t marry two completely opposite meal plans. Like I did with the meal above. 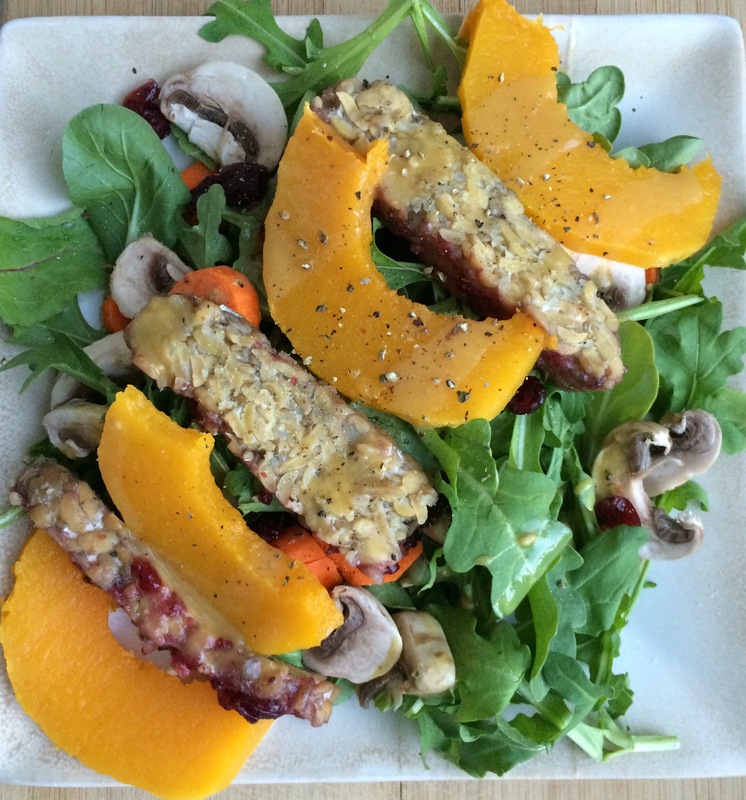 On my plate: Mixed supergreens, chopped button mushrooms, dried apple-juicesweetened cranberries, baked butternut squash, cranberry-onion marinated baked tempeh, carrots, and home-made honey mustard dressing. On his (not pictured, but devoured! ): Cranberry Pork Roast and salad and bread. I made it from Kelly McNellis’ AWESOME slowcooker cook book, but here is a link to the recipe on her blog. When I made the marinade for the pork, I separated some and used it to marinate tempeh. If you truly wanted to make it vegan, just skip the honey ( I did for mine and used a tiny bit of apple cider vinegar instead for tang). Previous postA Season for Everything. Next postHappy International Babywearing Week! Glad I’m not alone 🙂 ! My husband was much more adventurous when we were dating. Ha ha! To each their own. Hoping, however, that our son will be less picky. Dude. This is 100% us! My husband is pretty much paleo (and hates most veggies except canned boiled green beans) and I eat vegan/vegetarian since I was born! I used to cook both too, but since baby its been harder. What are you going to do with baby? Currently my son is a vegetarian with me . Thanks for stopping by 🙂 Butternut squash is the best! !